Paul Cook shrugged off the disappointment of Pompey’s latest Fratton Park stalemate as he insisted: We are on the right track. The Blues boss saw his side create the better chances as they were held to a goalless draw by Luton Town – managed by former Pompey boss Andy Awford. After the 3-2 loss at Leyton Orient on Boxing Day, Cook was looking to bounce back with a victory on home turf. But despite a decent performance and some good chances created, Pompey had to settle for a point. 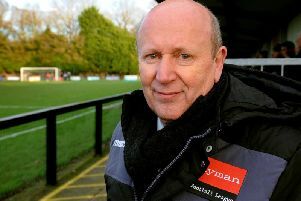 Cook, however, has no concerns and has faith that Pompey remain in good shape to mount a successful promotion campaign. ‘I thought it was actually a very, very good performance – unfortunately, we didn’t win,’ said Cook. ‘I respect that our supporters went home a little bit disappointed. ‘They came out in their numbers and they wanted to see us win. ‘Unfortunately, it doesn’t always happen like that, but we did just about everything right – apart from find that elusive goal. ‘But we have 22 more games to go, there are a lot of points to play for, and if the players keep putting in performances like that, we will be where everyone wants us to be at the end of the season. ‘I’ve got great belief in this squad and the support that we get is phenomenal. ‘Together, we will get to where we want to be. ‘Had we won, it wouldn’t have guaranteed promotion. ‘And had we lost, it wouldn’t have meant we were finished. ‘We drew, so the same thing applies. Cook believes his side have made big improvements over the course of the campaign. And although it was a fifth 0-0 draw at Fratton Park this term, the manager felt his side carried much more threat than in those previous shut outs. He said: ‘It was different to some of the other 0-0 draws we’ve had at home. ‘We looked a threat, we had plenty of chances but we just couldn’t get the goal. ‘If we play like that in every game, we will win the majority of them. ‘We had numerous chances and I don’t remember Luton creating very much. ‘We looked organised and solid at the back. ‘I just felt that we looked an accomplished team. ‘It’s a long season and my job is to improve the team over the season and get us to a place that we are happy with. ‘I think people have seen that we are getting better as a side. ‘But you are never happy at Christmas, even if you are top of the league. ‘We are playing well at the minute and it was only the sending off on Boxing Day which stopped our unbeaten run. ‘There is such a long way to go and I see this team improving all the time.